Part of the British Virgin Islands, Jost (pronounced Yost) Van Dyke has a reputation as the Caribbean's party capital, and for good reason. Watering holes like the Soggy Dollar, Foxy's, Corsairs and Ivan's Stress Free Bar attract yachts and sailboats from around the region, offering a little camaraderie over cocktails. Other than bars and beaches, there's not much to do on Jost, which at three square miles is the smallest of the BVI's four main islands. And that's just fine with most visitors who come to this undeveloped spot to relax and have a good time. The two areas where cruise ship passengers usually visit -- Great Harbour and White Bay -- have only minimum services. Stores and shops cater mostly to yachters who come for provisioning; the island population numbers approximately 300. Day-trippers from Tortola abound. The cruise lines that make Jost Van Dyke a port of call are mostly luxury and small ship lines like Seabourn Cruise Line and Windstar Cruises. One thing that Jost Van Dyke does offer is water sports. The Caribbean Sea is particularly gorgeous around the BVI, as evidenced by its popularity among divers. While outfitters are limited, you can arrange snorkeling, sailing, speedboating and stand-up paddleboarding excursions or even rent your own dinghy for the day. 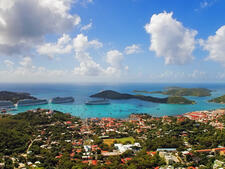 Try BVI Sea & Land Adventure Sports or Jost Van Dyke Scuba. 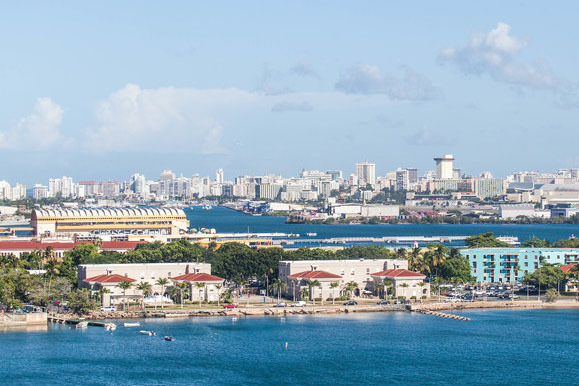 You'll be anchored and tendered ashore to one of two bays: White Bay or Great Harbour. (The two are connected by a hilly roadway, and intrepid hikers can walk the two-mile stretch.) Neither terminal has any facilities to speak of. The mountainous, compact Jost Van Dyke, just four miles long, is one of the Caribbean's true getaway spots, with nary a posh resort or casino in sight. Great Harbour is the more "developed" side of the island, with numerous wood-shack eateries like Christine's Bakery (try the coconut bread) and open-air cafes and bars like Corsairs. (Say hello to "Pizza Dave," who mans the pizza oven during the dinner rush.) There is a beach volleyball court for impromptu games. The most famous attraction on Jost is Foxy's Tamarind Bar and Restaurant, a sprawling open-air bar in Great Harbour that offers live entertainment, wacky celebrations and OK bar food. It's a big yachters destination. More peaceful is White Bay, where Ivan's Stress Free Bar and the Soggy Dollar Bar are located. There are also lines of lounge chairs, at no charge. Jost Van Dyke is a safe little community. Your biggest worry should be protecting yourself from sunburn as you frolic on the beach or hike from one of Jost's bays to the other. On Foot: Easy. At White Bay, which is divided in two by a crop of rocks, use the beach to walk from Ivan's Stress Free Bar to the Soggy Dollar side. Bear in mind that you have to negotiate a rocky path to cross this stretch, so wear shoes. At Great Harbour, there's a roadway (sometimes a sand roadway) that runs along the harbor, and all the cafes and bars front that. There is no ATM or bank on the island, so be sure to bring cash and your credit card. 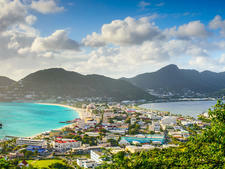 U.S. dollars are the official currency of the British Virgin Islands. 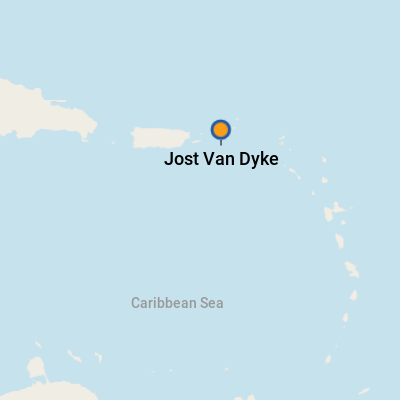 English is the official language of Jost Van Dyke. All of the restaurants on Jost Van Dyke are super-casual (not surprising since their bars are really the main attraction); flip-flops and tattered T-shirts are a-OK. But just because the atmosphere is casual doesn't mean you won't enjoy a fantastic meal. Most restaurants focus on fresh fish, burgers, salads and chicken roti (a popular West Indian dish). Foxy's Foxhole Boutique in Great Harbour sells the locally made Foxy's Firewater Island Rum. This is the only place in the world where you can buy a bottle. The Painkiller. Legend has it that this delicious (and potent) cocktail was invented by bartenders at Jost's Soggy Dollar Bar. It's made with Pusser's dark rum, cream of coconut, pineapple juice and orange juice and topped with freshly grated nutmeg.